This article is about the god. For the city of the same name, see Vivec City. Vivec is the Warrior-Poet of Almsivi and the Guardian God-King of Vvardenfell. He is worshipped as a living god by the settled Dunmer. 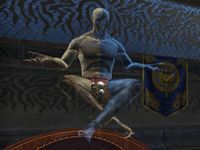 Vivec can be encountered at his Palace in Vivec City. You will be tasked with acting as Vivec's eyes and ears as part of Morrowind's main quest. Canon Llevule: "This is the person who helped me at the tomb." 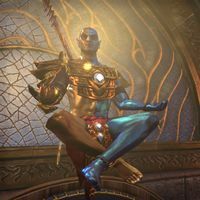 Archcanon Tarvus: "Lord Vivec, we don't need the help of this... Outlander." Vivec: "Oh hush, Archcanon Tarvus. Outlanders have their usefulness. This one intrigues me." Archcanon Tarvus: "As you say. I'll be in my office if you need me." Vivec: "Step forward, friend of Llevule, and let us speak." "Canon Llelvule says you helped him in his mission. As I have written, "the one who helps my ally becomes my friend." Despite the Archcanon's concerns, I greet you with sincerity and pose a simple question. Will you assist us further, Outlander?" What kind of help do you need, Lord Vivec? "I have Ordinators and Armigers at my disposal, vast armies of followers and dedicated priests. What I don't have, however, is a fresh perspective. Will you set aside your personal goals for a time and become the eyes and ears of a god?" Of course, Lord Vivec. I can provide a fresh perspective. "Good. I need assistance to investigate a…strange phenomenon that the ancestor confirmed may indeed be a problem. We'll start with a simple divination ritual. Archcanon Tarvus can tell you what we need to delve into this mystery." "Between the cryptic warnings of the ancestor spirit and the unexpected result of the divination ritual, I fear there may be more astir than I imagined. We solve the greatest mysteries by accident, I suspect. Hmm. I should write that down." Something went wrong during the ritual. Did you learn what you had hoped? "We learn from every action we take. Failure or success, each result teaches us something, at least in the larger sense. To be more specific ... no, not as much as I hoped." "Images that suggest avenues to investigate, riddles to solve. Let me tell you a secret, Outlander. It concerns a Living God and energy that fades like daylight as dusk spreads across the land." I don't understand, Lord Vivec. "Listen well and speak not a word! My divine energy, it drains away. Whether from illness or foul malady, I know not. You must travel the land and seek answers on my behalf. But first, "Gratitude before service," as I have written. So, thank you." "The ritual confirmed my worst fears—divine energy flows out of me for no reason that I can discern. I felt the power imbued within my Blessing Stone get wrenched away as soon as you added it to the ritual. I couldn't stop it." You're losing divine energy? How is that possible? "To quote my own words as the Warrior-Poet, "No lock exists that the determined thief cannot open." Follow the trail of my missing energy and try to discover the identity of the enemy Llevule's ancestor warned us about." You think an enemy is responsible for your energy loss? "Something drains my energy. Find Archcanon Tarvus in his office and ask if he gleaned anything useful from the ritual. If not, I know his earlier research indicated new avenues to investigate. Go where he tells you and learn what you can." I'll talk to Archcanon Tarvus. "My divine energy diminishes with every passing moment, but the ritual confirmed my affliction is not natural. I regret that I could not reveal the full nature of these dire circumstances until your trustworthiness had been demonstrated." I'm not sure Archcanon Tarvus shares your assessment of me. "Yes, well, Archcanon Tarvus has always been cautious about ideas and ideologies that didn't originate within the Tribunal. And recently, that prudence has grown a thousandfold. He's a faithful servant, however, despite his narrow-mindedness." ""The river drains into the sea, as my divinity flows out of me." Hmm. Needs some work. As you can see, I continue to lose energy, and it has made me somewhat agitated. Have you made any progress toward discovering the source of my discomfort?" I think that an Ashlander named Chodala might be responsible for your condition. "An Ashlander? That seems unlikely, but I trust your instincts. We need to find out more about this Chodala and the ancient enemy that aids him. Take this. Another token of my appreciation. And look, here comes the Archcanon now." "As a god weakens, so too does his city suffer. I know my people grow fearful. Even the Archcanon is distressed. But the energy that remains to me holds the moonlet in the sky—at least for now. So, what news does my eyes and ears bring to me?" We discredited Chodala as the Nerevarine, but he escaped with Sunna'rah. "How this upstart Ashlander learned to attune Sotha Sil's tool confounds my understanding. And he dares use my power? Still, your help is appreciated. Every strike and parry takes us one step closer to ending this threat and restoring my vitality." Vivec: "Barbas... pet hound of the Prince of Bargains. I should have known. Talk to the Ashlander while I... compose myself." "Azura's champion... is correct. That was Barbas, faithful hound of Clavicus Vile. A shapeshifter. He killed the Archcanon... took his place. Chodala... Sotha Sil's device... impersonating Tarvus... it was all part of some elaborate plan." Plan? They tried to kill you! "That was simply a consequence. They needed Tribunal energy to locate the Clockwork City.. I was the easiest target. If Barbas enters Sotha Sil's city... disaster will follow. I appreciate your help, but I must conserve what remains of my energy." "Clarity emerges … like sunlight breaking through the clouds …. Barbas must have replaced the Archcanon weeks ago … all to set the wheels in motion to steal my divine energy …." He went to a lot of trouble just to steal your divine energy. "Every move … has a purpose. Stealing my energy sowed discord and disaster … throughout the land … and ultimately revealed the location of … the Clockwork City. If Barbas and his master can bypass the wards and enter Sotha Sil's domain …." This has all been a ploy to find the Clockwork City? "Clavicus Vile distracted me, weakened me … all to locate the Clockwork City. Perhaps we require a Daedra … to fight a Daedra. Azura's champion, Seryn … in the Archcanon's office. Seek guidance from her patron. But hurry, my time grows short …." I'll find Seryn and see if Azura can help us. "My time … draws to a close …. Were you … successful? Can you restore … my energy?" I have the staff, but the last time it nearly killed you. "So you retrieved my … stolen energy. You … stopped Barbas …. Now … return what is rightfully mine …." But how can we be certain the staff won't harm you again? "o quote my … seventy-fifth exhortation … "certainty is the brother of fear." Nothing is certain, but I have confidence … in you… in what you have done. Use the staff …. return my energy. Or not. In a little while … it won't matter." All right, I'll use the staff. "Remarkable! No ordinator or armiger could have done any better! You uncovered a Daedric spy in our midst, brought a Living God back from the brink of death, and saved all of Vvardenfell. "As my next sermon shall proclaim, "Modesty is the false cloak off a flatterer or the sincere garment of the humble." Again, you have my gratitude, and that of all my people. Indeed, even those who rail against the Tribunal owe you their lives." "You have done much for me and for Vvardenfell. But as the warrior says, "Do not think the battle is over when the enemy is dead. The hearts and minds of the people must also be won." I must ask you for one more service." "Gratitude is its own reward," I once told the crowds in Ebonheart. But I've found that some of my followers appreciate something more tangible. Help me reward those who aided in the saving of Vvardenfell so we can reassure my people." How can I help you reward people? "To start, retrieve the Archcanon's Signet from the Hall of Wisdom. It is time to appoint a new head priest. I shall gather my people and meet you at my statue on the central canton. It shall be a glorious ceremony, my friend!" Once you have retrieved the Signet, leave the Archcanon's Office and head west to the other end of the canton to meet Vivec for the ceremony. As you approach, Vivec will be talking to the crowd ("Rejoice! You cursed the darkness, with good reason. Now Praise the return of the light!") Speak to him to start the ceremony. "The eyes and ears of the Warrior-Poet returns! And just in time for the gathering crowd! Were you able to locate the Archcanon's Signet?" Yes, I have the signet right here. "Continue to guard it, for it represents not only my loyal servant Tarvus but also the past and future of my priesthood. And take this as well. To aid you in your next task." "You have been my eyes and ears in the world. Now be my hands. Within that modest sack resides gifts for my faithful servants. Blessings from me, though I would have you deliver them. You served me in adversity. Now join me in celebration!" "As I call forth my faithful, reach into the sack and give them the first thing you find. They shall hear my words of praise and gratitude, while it shall be your hand that rewards them. Are you ready, friend of Vivec?" Vivec: "Overseer Shiralas, you sacrificed your Blessing Stones to aid the Warrior-Poet. Well done! Take these recharged stones and finish building my city - after relaxing with your patient wife." 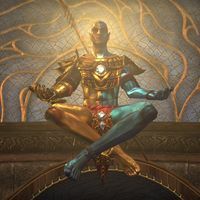 Vivec: "Your knowledge of the mysteries of my brother Sotha Sil and the intricate twists and turns of portal magic were invaluable. Take this and use it well to further your experiments." Vivec: "Archcanon Tarvus served us well until his death. But when I was most in need of assistance, Canon Llevule rose to the occasion. Now rise once more - as Archcanon Llevule!" Vivec: "In every poem, it's the last stanza that holds the most meaning. Once a stranger in our land, now a friend forever - step forward!" "You come before me with an empty sack, but have no fear. As I have written, "treat your enemies well and your friends even better." Know that I consider you to be a very good friend. Will you accept the honor I am about to bestow upon you?" "Then let it be known that from this moment forth, you shall be called Champion of Vivec! And along with my thanks, take this modest reward. I foresee even greater achievements in your future, but for now be content to be the hero of Morrowind!" "The Warrior-Poet shall write of your deeds in story and song, my friend. You will be remembered for your service to Vvardenfell. Now go, see the wonders of our great land. There are others who need your help, of that I'm certain." "I thought you might be Archcanon Llevule. He's been very busy since we last spoke. I'm afraid Barbas's impersonation of our poor Tarvus did not extend to keeping the temple books in order. Our records are in shambles!" "One crisis ends and another begins. Such is life on this rock we call Nirn. Nothing to concern yourself with, my friend. At least, not at the moment." "I usually don't discuss my works-in-progress, but I know I can trust your discretion. I am currently composing a poem about how friendship endures through hardship. With so many songs about war and betrayal, we need more that speak to compassion." "Did you notice that I haven't moved Baar Dau back to its original position. It's in no danger of falling, thanks to you, but as I wrote in the Ballad of Red Mountain, "All actions have consequences and pose some risk." Best to leave it alone." The Enigma of Vivec can be encountered in the Tribunal Temple in Mournhold, and the Servant of Vivec can be spoken to near Ebonheart. A holographic projection of Vivec is also seen at the Elegiac Replication in Clockwork City. Vivec's voice actor is Robin Atkin Downes (IMDb), who previously voiced Brynjolf in Skyrim. The opening cinematic for the Morrowind tutorial is narrated by Vivec. This page was last modified on 26 January 2019, at 22:14.